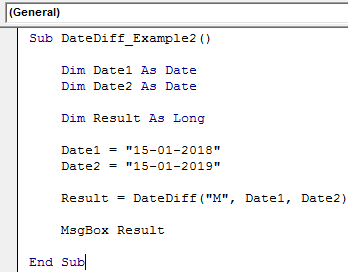 DATEDIFF Function in VBA calculates the difference between in two dates in days, months, quarters, and years. 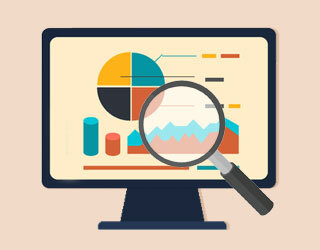 In excel finding the difference between two dates has many ways. 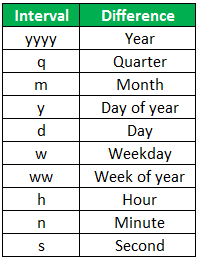 You don’t need a special formula to calculate the difference between two dates. 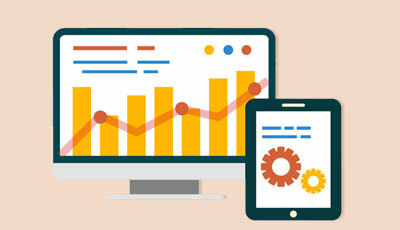 For an example look at the below image. 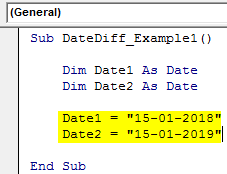 If we want to calculate the difference between these two dates we can simply subtract the date 1 from date 2. It has given us the difference between two dates in a number of days. This is what the problem with this generic formula. If we need the difference in months, years, quarters etc… it cannot give. 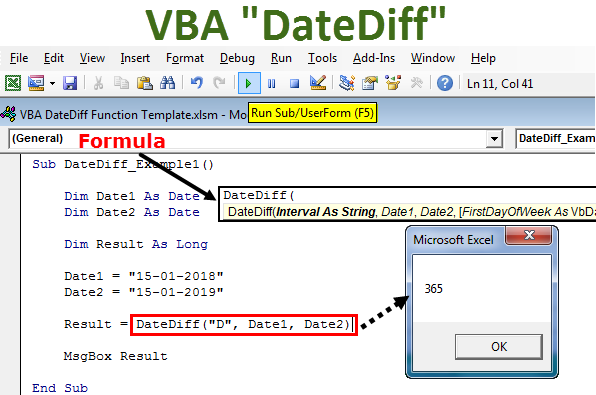 In this article, we will show you how to use this DateDiff function in VBA. 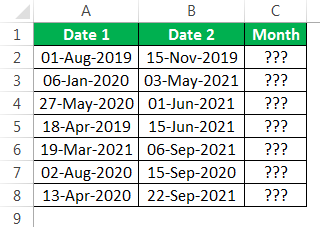 What is the DATEDIFF Function in Excel VBA? 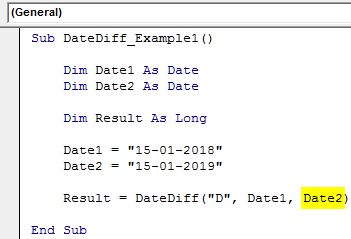 DATEDIFF in VBA stands for “Date Difference between two dates”. This function can give us the number of the time interval between two dates. 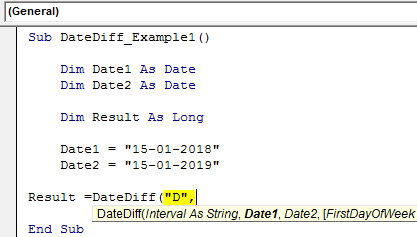 When we want to find the difference between two dates we can find it in days, weeks, months, quarters etc..
To understand the function look at the below syntax of the function. Interval: This nothing but in what way you want to calculate the date difference. Whether it is in days, months, weeks, quarters etc… Below is the list of the same. Date 1: What is the first date you want to find the difference. Date 2: What is the second date you want to find the difference from Date 1.Date 1: What is the first date you want to find the difference. 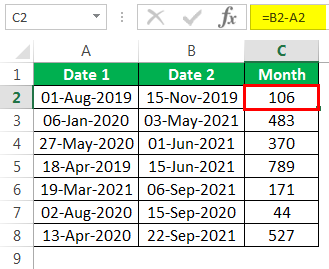 Here formula is Date 2 – Date 1. [First Day of Week]: What is the first day of the week? We can following arguments. [First Week Of the Year]: What is the first week of the year. We can enter the following arguments. 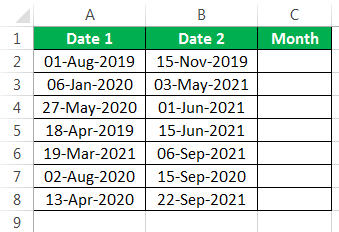 Following are the examples of excel VBA DateDiff. Assume you have two dates “15-01-2018” and “15-01-2019”. Let’s find all kinds of differences for these two dates. 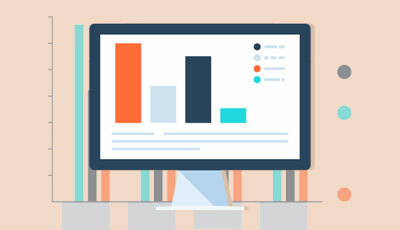 Step 2: Define Two Variables as Date. 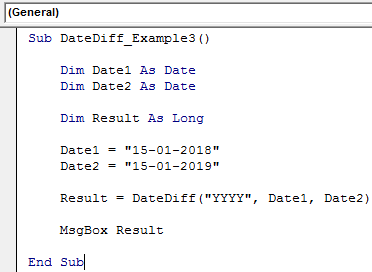 Step 3: Now for Date1 variable assign “15-01-2018” and for Date2 variable assign “15-01-2019”. 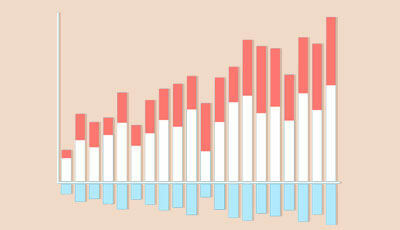 Step 4: Now to store results define one more variable as Long. Step 6: First argument is what kind of difference we need between these two dates. Let’s say we need to find the number of days, so supply the argument as “D”. Step 7: What is the first date to find the difference. Our first date is “15-01-2018” that we have already assigned to the variable “Date1”. So supply the variable name here. Step 8: What is the second date to find the difference. 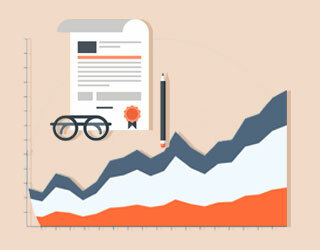 The second date is “15-01-2019” which hold the value through variable “Date2”. Step 9: Ignore the last two parameters. Now assign the value of variable “Result” through the VBA message box. 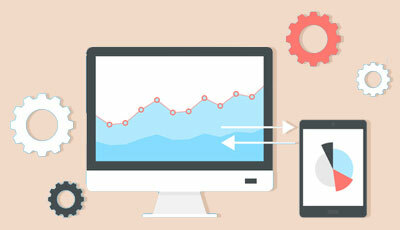 Now run the code using F5 key or manually, we will get the difference between these two dates in a number of days. So, from “15-01-2018” to 15-01-2019” exact difference is 1 year, so we got 365 days as the result. 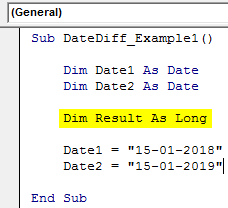 Like this, we can find the difference between two dates in time intervals. Run this code Using F5 key or you can run manually to show the result as given below. Run this code using F5 key or manually to see the result. 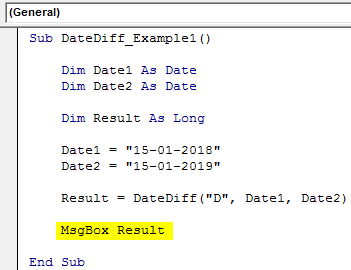 I hope you have understood the function of VBA DATEDIFF. Take look at the below homework for you. Find the difference between below dates in “Months”. If you have not found the way below is the readymade code for you. You can run this code manually or press F5 key to see the result.